“For the mystery of lawlessness is already at work. Only he who now restrains it will do so until he is out of the way” (2 Thess. 2:7). 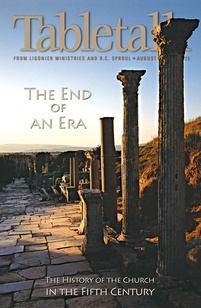 As we noted yesterday, issues concerning eschatology (the study of last things) continue to be hotly debated in the church. One of the reasons for this is our uncertainty regarding some of the contexts surrounding the writings of the apostle Paul. Perhaps this is nowhere more evident than in today’s passage in which Paul speaks of events that must precede the return of Jesus. This passage raises many questions, but we will spend time today discussing the identity of the restrainer the apostle mentions. Paul tells us that Jesus will not return until the man of lawlessness is first revealed (v. 3), and this man of lawlessness cannot be revealed until “he who now restrains” him is taken away (vv. 7–8). Our limited knowledge about the original situation faced by Paul’s audience makes this passage difficult. For it is fairly clear that this audience knew exactly to whom Paul was referring when he mentioned the restrainer. While the text does tell us that the original audience was having questions about the return of Christ, it does not identify who the restrainer is. Thus, we should be careful about being dogmatic about who the restrainer is. Some enthusiastically identify the restrainer as the Holy Spirit and have said that this passage teaches a pretribulational rapture of the church. As the thinking goes, since the Holy Spirit indwells the church, if the Holy Spirit is removed, so then must the church that He indwells be gone from the earth. Though this interpretation is not impossible, the difficulties with the rapture theory mentioned in yesterday’s study make it unlikely. Even if the Holy Spirit is the restrainer, all Paul would have to be saying in this passage is that He is ceasing His work of restraining evil, not that He is necessarily gone from the earth. Whoever the restrainer may be, we must always remember that it is God who ultimately determines when the restrainer is removed. It is by His hand that all things come to pass (Eph. 1:11), and because of His goodness we can trust Him to preserve His own people forever, no matter how His sovereign will is worked out (John 6:39). Knowing the identity of the restrainer mentioned in today’s passage would indeed be a good thing for our understanding of this text. However, whether or not we are ever clear of the identity of this restrainer, the important point of today’s passage is that we see God’s sovereign control of the return of Christ. For it is God who ordains these signs and who ordains the time of Jesus’ return. Let your trust in His sovereignty sustain you as you hope for the return of our Lord.